Enterprise Mobility, the term refers to mobility of corporate data which forms an integral part of business infrastructure urging interactions at an extensive level. The primary challenges of enterprise mobility come down to three C’s—cost, complexity, and corporate data security. 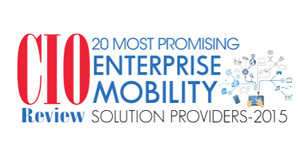 We present to you 20 Most Promising Enterprise Mobility Solution Providers of 2015. 3PHealth A company that provides integrated software, A leading provider of digital healthcare solutions. Air Watch Providing industry-leading identity, productivity and collaboration solutions to enable end users with a seamless digital workspace. Apakau Provider of a patent-pending geo-distributed application Data Delivery Net-work™(App DDN) that helps enterprises reduce network latency for web and mobile API performance. BlinkMobile Provides a cloud-based enterprise mobility platform that empowers organizations to build and deploy activity focused apps quickly. Boston Technology Corporation A provider of Mobile and Web software development services. eBiz Solutions A global technology and solutions company, delivering innovative product engineering, analytics, digital solutions, mobility , cloud, Internet of Things (IoT), Big Data and enterprise services. Evora IT Solutions A leading international consulting and software development agency, specializing in mobile workforce management software. FieldAware A provider of made-for-mobile, cloud-based software that enables field service companies to take full and rapid advantage of mobile environment. Mobile Labs Providing enterprise-grade, next generation testing tools for mobile app testing, mobile device testing and mobile website testing. MobileIron Providing security and management for documents, and devices to enable organizations embrace mobility as their primary IT platform. Movilizer A company that provides the tools and features to help companies build mobile apps faster. Oxford Computer Group Enterprise mobility experts that make organizations’ IT systems work efficiently with identity and access management, device management, and systems management solutions. ServicePower Provides solutions for both staff and third party workforces majoring on workforce planning, automated scheduling and dispatch, and BI. Streebo Provides automated and enterprise mobility solutions that streamline complex business processes. Telstra Provides management of IT and telecommunications services, search, and information services. Tensing Tensing specializes in international implementations of GIS and enterprise mobility to improve field force automation. Trigcom AS Provides solution products and services for the management and support of mobile phones and tablets. Usablenet Empowering companies to create unique mobile, tablet, and in-store experiences for their increasingly connected and mobile users. Vox Mobile Provides for complete enterprise mobility, addressing every aspect of mobile technology planning, management and support.